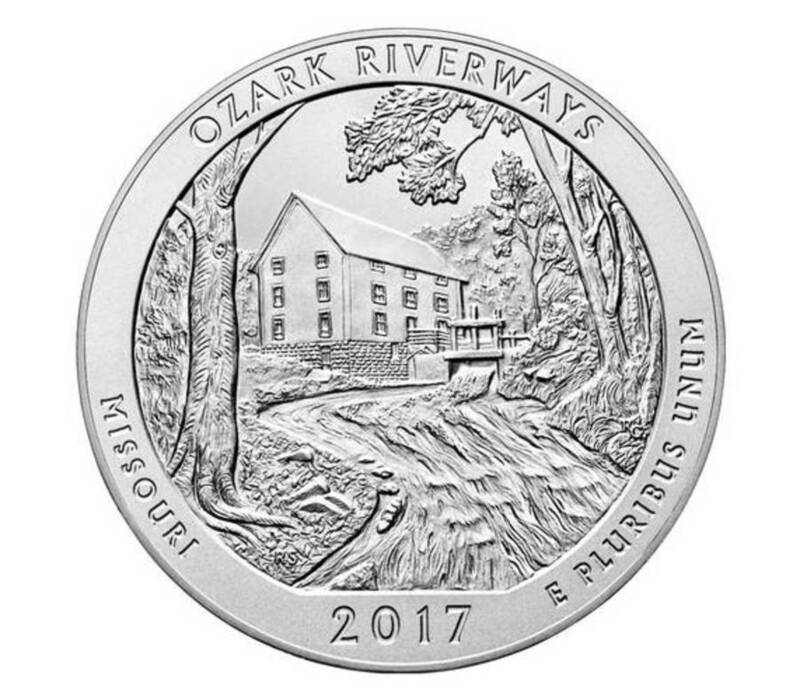 The Ozark National Scenic Riverways 2017 Uncirculated Five Ounce Silver Coin is composed of 99.9% silver. Ozark National Scenic Riverways was established in 1964 to protect 134 miles of the Current and Jacks Fork Rivers in the Ozark Highlands of southeastern Missouri. The park encompasses 80,785 acres of unique natural resources, including a world–class spring system that is unparalleled in North America, more than 400 caves, and other special geologic features. The rivers offer remarkably clean, clear water that is complemented by the breathtaking blue shade of the waters of the large springs. The spectacular natural beauty of the area attracts park visitors to participate in a variety of recreational opportunities, such as john boating, canoeing, swimming, and fishing. Hiking, hunting, and horseback riding are also enjoyed across the landscape. In addition to the unique natural features of the Ozarks, the National Park Service preserves the heritage and lifeways of the Ozark culture, which was heavily shaped by the remote and rugged landscape. The park manages 249 historic structures throughout the park and also preserves the history and remnants of prehistoric peoples who settled in the region during the past 12,000 years.